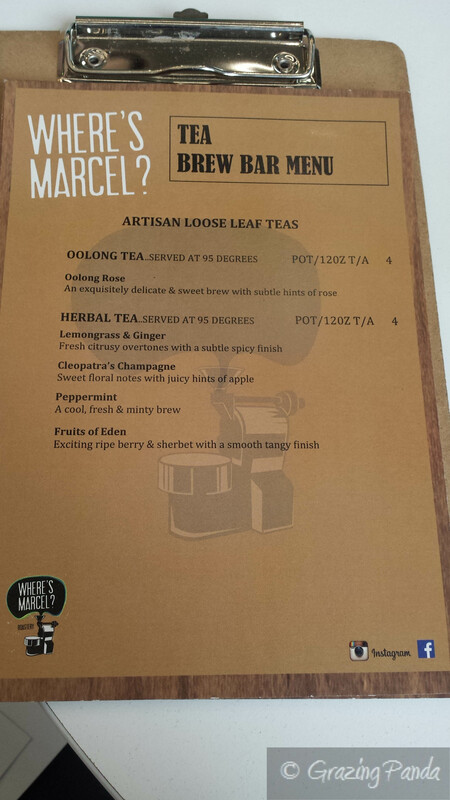 Where’s Marcel? – Great Vibe & Super Friendly! I am always on the lookout for new cafes and new coffee joints in and around the city – as most times the new cafes are located in the suburbs or inner city – both of which I cannot access during the week when I am at work. My latest find – Where’s Marcel? – is thanks to moving onto a new client for work and hence a new work location. Where’s Marcel is located in the foyer of 180 Lonsdale St (near the corner of Russell and Lonsdale Street) – which used to be the BHP Biliton building and is near QV. 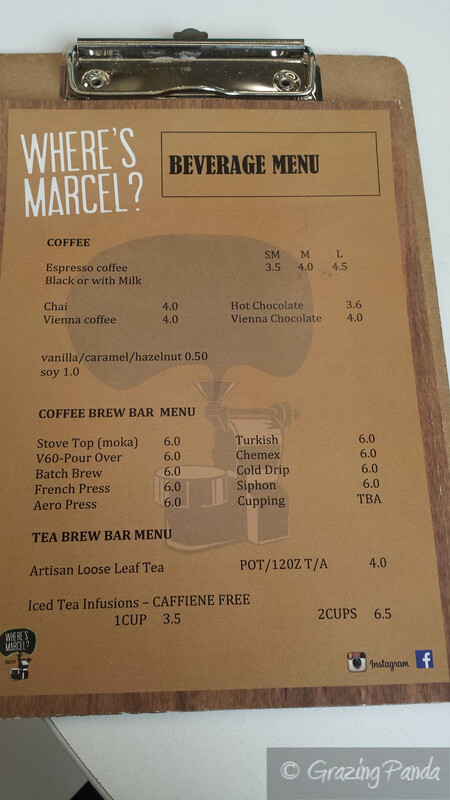 Where’s Marcel is a boutique coffee roastery and cafe with a casual and friendly vibe in a modern and welcoming setting. 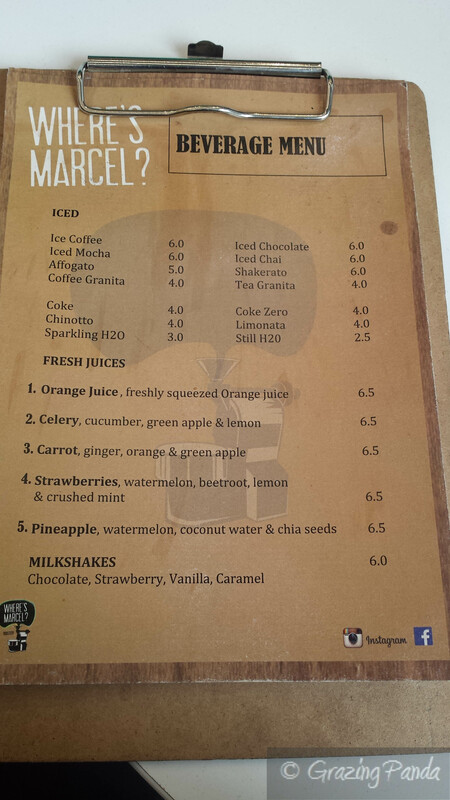 Where’s Marcel has an extensive menu of drinks available from coffee, tea, to fresh juices, milkshakes and iced tea infusions – the menu is spectacular. Coffee lovers will definitely enjoy what’s on offer here – they have a Brew Bar Menu which consists of Stove Top, Turkish, V60-Pour Over /Chermex, Batch Brew, Cold Drip Filter, French Press, Aero Press and Cupping. 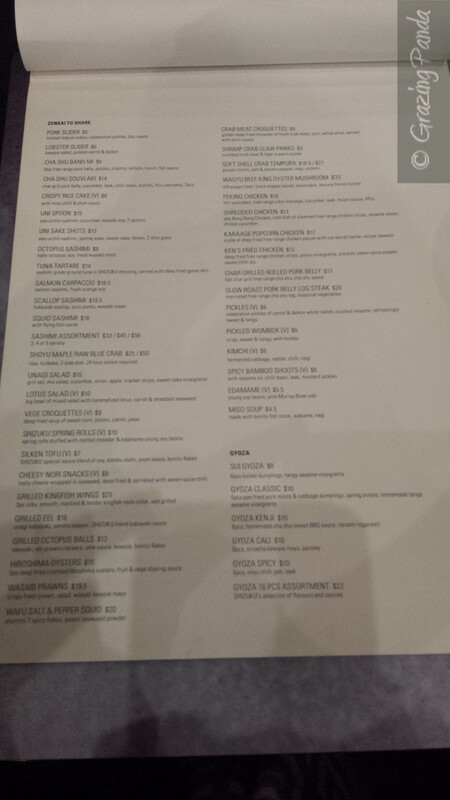 Have a look at the full menu in the pictures above. They roast their own coffee and have 3 different blends – Culture (this is the stronger blend), Evolve and Decaf. Along with having a great variety of beverages on offer – they have an equally impressive food menu – consisting of sandwiches, salads and burgers, not to mention their delicious sweet varieties – cakes and raw balls. All food is made freshly each day with love and care. On my first visit I was too tempted by the cakes and had to order one – I went with the Spice Apple Tea Cake with Maple Icing. I also ordered a Latte. The coffee was great – strong with hues of nuts and honey and the perfect amount of crema. The cake was absolutely divine – the combination of the soft, melt in your mouth spiced apple tea cake together with the sweetness of the maple icing. I would highly recommend anyone try this cake out – it is that good! Posted in Breakfast, Brunch, Coffee, Desserts, Healthy Eating, Lunch	Tagged Aero Press, Batch Brew, breakfast, breakkie, Brew Bar Menu, brunch, burger, burgers, cafe, cappuchino, carrot cake, cbd, coffee, Cold Drip Filter, crema, culture, Cupping, decaf, evolve, french press, friendly, healthy, iced tea, iced tea infusions, latte, lonsdale street, lunch, marcel, melbourne, melbourne cbd, near qv, open sandwich, qv, raw balls, roastery, Salads, sandwiches, spice apple tea cake with maple icing, spiced apple teacake, Stove Top, teacake, Turkish, V60-Pour Over /Chermex, warm, welcoming, where's marcel? Waffee – Waffles & Coffee – The Perfect Combination! Who doesn’t love a good waffle? I have walked passed Waffee many times to and from work and finally I had the time to stop and enjoy the waffles (excuse the pun!). Waffee – aptly named as they sell both Waffles and Coffee – is located on Swanston Street (near the corner of Collins Street – and right where the Tram stop is located). Waffee is the creation of two brothers who share a passion and dream of creating the perfect Waffle. Their quest took them on an adventure to Belgium where they perfected a secret recipe to create these wonderful fluffy pillows of greatness. As you walk past the store – you almost do a double take as you can watch the Waffles being created right in front of your eyes – not to mention the delicious smell that is wafting in the air. The fit out is minimal but chic at the same time, designed by Hecker Guthrie – wooden combined with modern marble accents. 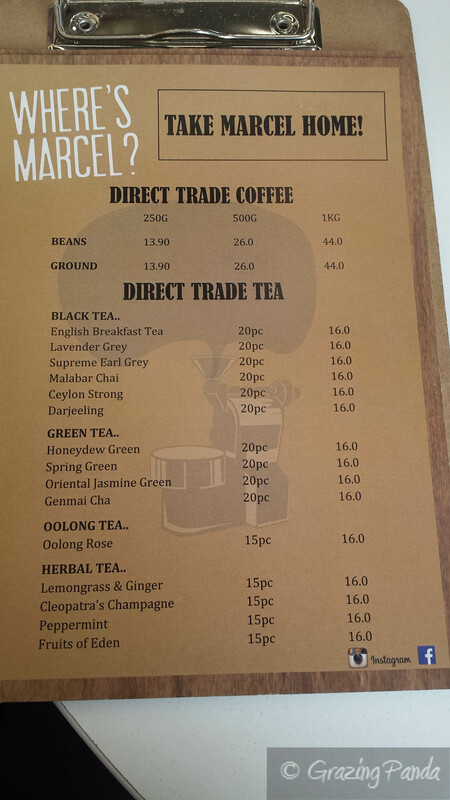 There are a few high tables that you can enjoy your parcels of goodness. I especially love the Waffee logo – created by A Friend of Mine – the Waffee name incorporated into the waffle griddle iron pattern along with a cute raccoon character that features on their packaging and coffee cups. Initially I was just going to sample the original waffle, but then I kept looking at the Premium Waffle of Raspberry White Chocolate and decided I had to try that one. I love raspberries (well any berries really) and white chocolate is my fave out of the chocolate range. I love the packaging that the Waffee has – simple yet effective – a little white pocket that allows you not only easy access to take that first mouthful, but where you can see the shimmery deliciousness. The waffle comes served warm and was crunchy on the outside with soft pillowy textures on the inside. The raspberries were laced through the dough and were fresh and tangy – this complemented the sweetness of the white chocolate that had been drizzled on the outside. I really enjoyed this pocket sized sweet delight and definitely will be back to check out their other flavours. The Emporium Melbourne store creates both Savoury and Sweet waffles, with a view in the future to revolutionising how waffles are to be eaten. Think fresh berries placed on topped of waffles served with a dollop of cream or scoop of ice cream – Yum! Their savoury waffles include waffles with crunchy chicken and slaw, smoked salmon salad and BLT just to name a few. 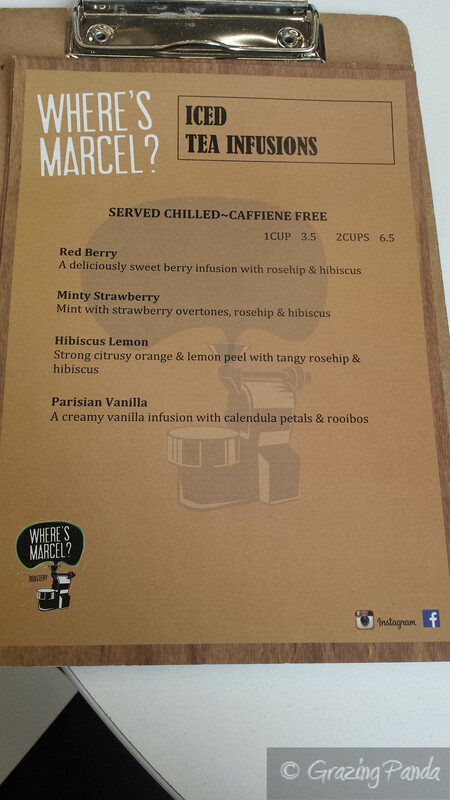 They have even expanded to create unique breakfasts such as Eggs Benedict on Waffles!I didn’t get a chance to try out their coffee; however Waffee uses Proud Mary coffee and serve a range of specialty brews that are sure to be delicious! 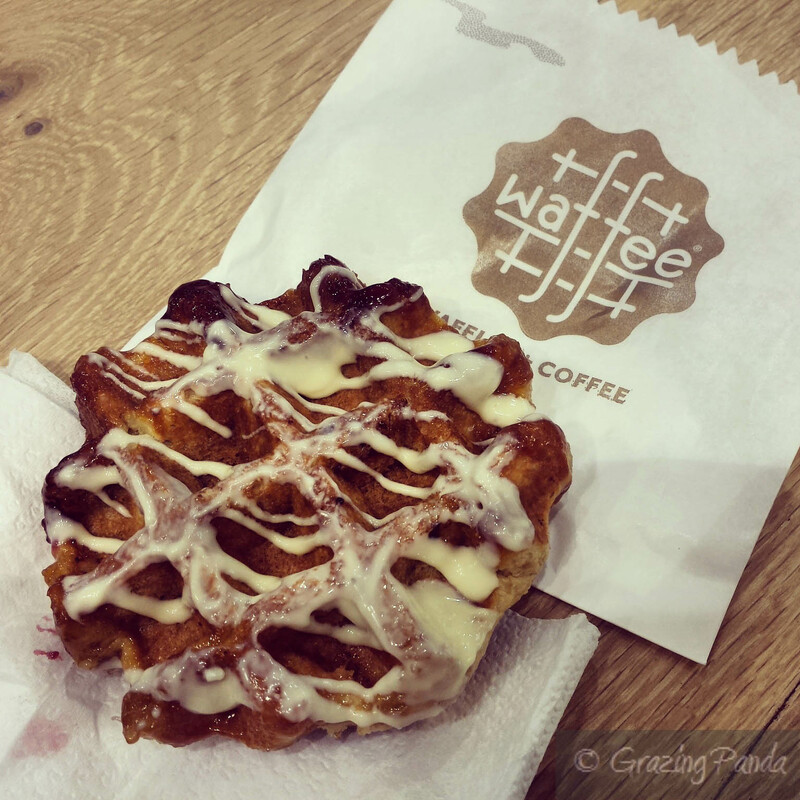 For a quick, tasty and delicious sweet hit in the form of authentic Belgian waffles – check out Waffee. Menu – Original, Chocolate Glazed, White Chocolate Glazed, Cinnamon, Blueberry, Chocolate Stick and Raspberry White Chocolate. You can also refer to the pictures above. Standout Dish: Any of the waflles! Thank you to everyone that Voted, Shared, Liked and Enjoyed Grazing Panda – Grazing Panda has been voted the The Tastiest Blog for the Menulog Food Lover Blog Awards2014! 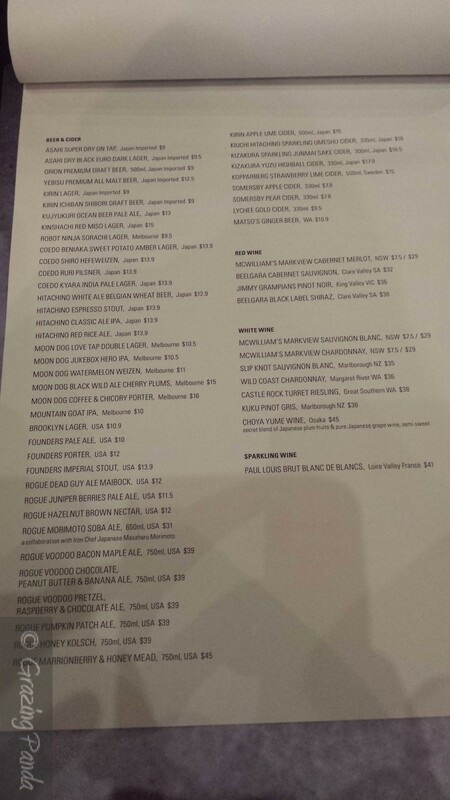 I cannot wait for all the new restaurants, cafes and bars that are opening up in and around Melbourne in 2015. Keep checking back for updates at Grazing Panda on a regular basis. There will be new & big things coming to Grazing Panda in 2015! Stay tuned! Until then have a Great and Safe Christmas and a Fantastic New Year!! Shizuku – Ramen & Ramen Burger Extravaganza! Shizuku is located at the Abbotsford end of Victoria Street, and is a recently opened Japanese restaurant, nestled amongst a street that is known for its Vietnamese cuisine. Their main focus is on Ramen – which sits up there as one of my favourite foods – and I cannot wait to try out their offerings. L & I arrived on a weekday night and were greeted by large heavy wooden doors – as you step inside you are greeted with a simple yet snazzy set up. There are lanterns hanging from the ceiling that remind you of flower blossoms that provide lighting for the whole restaurant. Your eyes are also drawn to the colourful bar counter which houses their variety of drink offerings as well as a tree branch that has been decked out with hanging clear baubles – I love this display, adds a touch of vintage chic to this otherwise modern looking venue. The tables are black and wooden; with seating able to cater mostly two’s and fours, however you have the option to join tables together for larger groups. David Chen is the owner of Shizuku who was inspired to open his own Japanese restaurant after working as an assistant manager at Shoya Japanese Restaurant. Together with partner, Shinako Suzuki, his dreams were made into reality, with doors opening for Shizuku in July 2013. 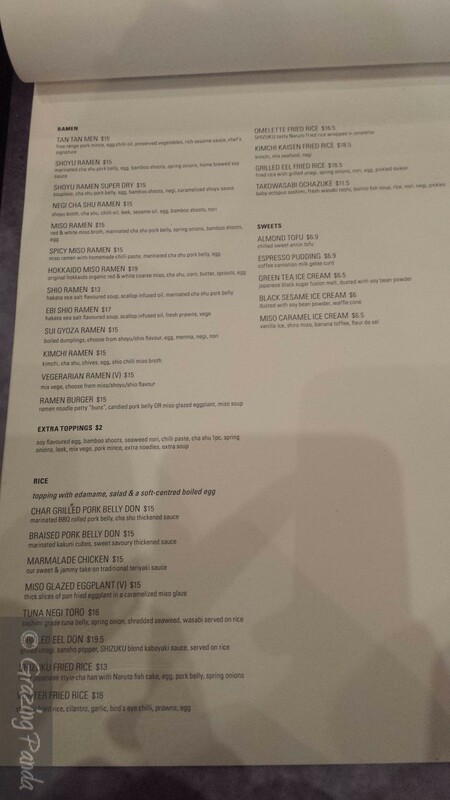 We are shown to our table and handed a book of a menu – there is so much variety to choose from! Another touch I like are the water bottles at the table, which are re-used colourful alcohol bottles that have been finished – adding a pop of colour to the otherwise black surroundings. Next on the menu is the star of Shizuku – authentic Ramen. Head chef Ken Yoshida who has a wealth of experience and has worked in some of Japan’s renowned ramen shops is the man behind this traditional ramen – which has been prepared over 15 to 18 hours. There are thirteen different types of Ramen to choose – from the Tan Tan Men to the Spicy Miso Ramen to the Kimchi Ramen, and they even have a Vegetarian Ramen. All Ramen is made with no MSG and they try to locally source ingredients – even the miso soup is made by the chefs onsite. What is definitely a game changer and what has critics raving is the Ramen Burger – created by chef Hiromi Hanzawa (previously Aka Siro and Pabu). The bun is made of tightly packed ramen noodles, that have been bound together with eggs and cooked on a flat top, with a lightly crunchy texture on the outside. The Ramen Burger comes in two different flavours – Candied Pork Belly with homemade plum and prune sauce, kewpie mayonnaise OR Miso Glazed Eggplant with sweet miso jam. These culinary creations hail from New York – where Ramen burgers are all the rage, but here at Shizuku they are the first and only Australian restaurant to replicate these delicious burgers. More on these later. Whilst we were waiting for our dishes to be served we were given a White Radish, Wombok and Wombok with Carrot dish to prepare the palate. They were all unique in flavouring with a consistent vinegary taste through all of them. Quite tasty. The first entrée we ordered was the Uni Spoon – Sea Urchin Sashimi, Cucumber, Wasabi Soy. Both L and I hadn’t had Sea Urchin before so were keen to see what type of flavour it had. The Uni Spoon (as the name specifies) comes served on a spoon, with a base of cucumber, topped with the sea urchin and drizzled with wasabi soy to finish. I ordered the Lobster Slider – Lobster kewpie salad, pickled carrot and daikon, corn brioche bun – as I wanted to see their take on a Lobster slider. The serving of lobster was quite generous, but I think there was a bit too much of kewpie mayonnaise added which drowned out the natural lobster flavour. I did enjoy the combination of the pickled carrot and daikon with the sweetness of the lobster and kewpie. My favourite dish of the day was the Shizuku Spring Rolls – Spring rolls stuffed with melted cheddar and edamame young soy beans. Just reading this dish on the menu set my creative juices flowing trying to envision what this dish would look like. The spring rolls were angularly cut to showcase the rich inside filling – which was the edamame soy beans enveloped in melted cheese. The combination was absolutely divine! The crunch of the outside combined with the soft billowy pea puffs and warm melted cheese was happiness in your mouth. Definitely one to try! We also couldn’t leave Shizuku without trying their signature Ramen Burger – Ramen noodle patty “buns”,miso glazed eggplant. The bun is made with ramen noodles bound together with eggs and cooked with a slight crunch on the top exterior layer – leading into a softer noodle layers for the rest of the “bun.” The filling was made of soft, delicious eggplant that was beautifully complimented by the miso jam. There were also salad leaves, coriander and onions added. Every bite you take of the ramen burger was delightfully filled with an explosion of juicy flavours – the burger was not greasy at all which further added to the ramen burger love. 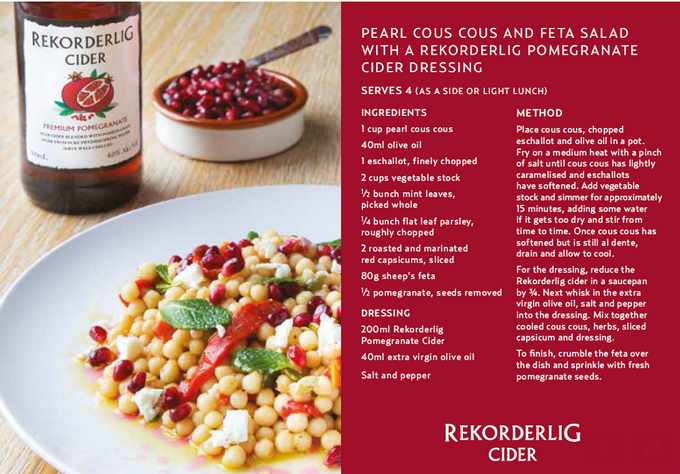 Yet another dish to try out – you have to experience it to understand the feeling! It was time for our main dishes – Ramen! L ordered the Tan Tan Men – Free range pork mince, egg, chilli oil, preserved vegetables, rich sesame flavoured broth – which is the Chef’s Signature Ramen as well as their best seller. L really enjoyed her ramen and almost finished her entire generous serving! I initially wanted the Spicy Miso Ramen – however as that was made with a pork and miso based broth I couldn’t, instead the helpful waiter told me to order the Vegetarian Ramen – Mix vegetables with miso sauce flavoured broth – with an added spicy chilli spoon to give it that spice and kick. The Ramen was quite tasty – the broth was thick, flavoursome and quite wholesome yet light at the same time – just the way that I like it. The vegetables added were fresh and still had a bit of crunch to it, which I think makes a dish better. The noodles were cooked perfectly which further added to the great quality of the ramen produced. We were both really full, however we did need something sweet to complete our palate sensations. There are five desserts to choose from which include Almond Tofu, Espresso Pudding, Green Tea ice Cream, Black Sesame Ice Cream and Miso Caramel Ice Cream. L ordered the Green Tea Ice Cream and I ordered the Pannacotta (which was a special for the day) which came served with Blueberries. Both desserts rated quite highly on our palates and were just the ending we needed to a great meal. Shizuku offers delicious food at an affordable price in a relaxed, welcoming ambiance together with friendly service. Next time you are considering suitable dining options with a homely touch check out Shizuku – it really is a welcome addition to Victoria Street. Pho24 – Pho in Under a Minute! The recent phenomenon in Melbourne seems to be a large amount of Vietnamese restaurants opening up at every turn you look. I happened to be driving on Spencer Street and another one caught my eye – Pho24. It was about a week or so later that I received an invite from Two Birds Talking to come and experience Pho24’s offerings. Pho24 is a franchised outlet from Vietnam, with the journey beginning 10 years ago and has 73 stores operating successfully throughout Vietnam, Hong Kong, Cambodia, Indonesia, Korea and Philippines. The main aim of Pho24 is to serve healthy pho to its customer in less than one minute, using a combination of simple and fresh ingredients in a modern and welcoming environment. Craig Birchall together with Andrew Bunn are the co-founders of the Australian Pho24 business – with Craig coming across the chain several years ago when he was travelling through Vietnam. He shared his story and background about how he came to realising that Pho24 would be a great fir for Australia. It was not only the products and the vibe of the place that Craig thought was fantastic but the passion, love and service of the staff – they really were proud of the food being produced. Pho24 is a quick and modern take of an old Vietnamese classic – that comes with no added MSG and is made with different techniques such as sous vide cooking style. This method allows for the retention of both flavour and nutrients – which you tend to lose in other methods of cooking. Together with this is their unique design of the nickel plated vats (PhoStillery), controlled evaporation, flavour and temperature which provides the clear stock to be infused with flavours perfectly. The equipment is also able to omit the fat layer of the broth that usually gets ladled out in other venues that sell pho. Pho24 is located in a great location – opposite Southern Cross Station – on the corner of Little Bourke and Spencer Street. It has easy accessibility from the Southern Cross shops as well as Etihad Stadium – great for the footy or concert crowds to stop by for a quick bite. The venue size is quite large in size with a great outdoor area which overlooks busy Spencer Street. As you step inside you are greeted with colourful lanterns that hang from the high ceiling – which further creates space. The venue is bathed with natural light thanks to the windows that wraparound, with wooden accents throughout adding a modern touch. There are projection screens which showcase scenes from Vietnam such as rice paddy fields and people enjoying street food. One of my favourite aspects of Pho24 is that there are herbs placed around the projection screens with scissors hanging to allow you to cut your own herbs to add to your dish. What a great concept! There are low wooden tables as well as high bench seats by the window to sit – depending on what you feel like. Most seats have a view of the open kitchen – where you can watch as your dishes are prepared in front of you. I also love the centre piece table setting which comprised of an Asian straw conical hat that dispenses tissues, alongside chilli sauce, soy sauce and Squid Brand fish sauce. When we first walked in we were greeted and served an assortment of handmade sliders and offered a selection of drinks – wine from DOC Wines, beer, soft drinks and coconut juice. I decided to have a coconut juice from Pearl Royal which was refreshing. It was great being able to chat to fellow bloggers, staff from Two Birds Talking as well as one of the founders of Pho24 – Andrew (Craig – the other founder- was busy in the kitchen prepping our food), whilst standing around having the canapés dishes. Nothing better than good conversation and nibbles of great tasting food to eat. We all proceeded to the long table that had been set up for the night (under the colourful lanterns) and were welcomed by Craig – who told us a little about the franchise and about what dishes we could expect tonight. The menu started off with Vietnamese Street Starters with the first dish being Fresh Vietnamese Rice Paper Rolls – that had been cut up into bite sized pieces and served on an oriental spoon. The rolls were fresh and had a kick of spice through it which tasted good – a light and healthy dish. Next starter to be served was the Baby Octopus Salad. The octopus salad came served in a glass jar with lettuce cups surrounding it. Craig told us that we were to spoon some of the octopus salad into a lettuce cup and then bite into it. The octopus was absolutely divine – tender bite size pieces of octopus paired together with vinegar and punchy chilli notes. I loved the combination of the crunchy fresh cold lettuce against the warmth of the octopus and chilli. A really great tasting dish that I could see myself eating jarfuls of. Next up was the Vietnamese Pork Bahn Mi (which I couldn’t eat) – but judging from the response from around the table and from N they were good! The bread was crusty and the filling fresh and juicy, with the pate having a subdued taste compared to traditional pates. Prawn Spring Rolls were next on the list. The spring rolls were filled with whole prawns and covered with a crispy layer of pastry. Just like with the octopus salad – we were told to wrap the lettuce around the spring roll and dip it into the vinegary daikon and carrot with a hint of chilli. The flavouring of the prawn spring roll was delicious and worked perfectly with the vinegar chilli sauce. I loved the combination and texture of hot (from the spring roll) and cold and crunchiness (from the lettuce). The next starter was the Slow Cooked Pulled Pork Steamed Buns (which once again I couldn’t eat). These came out steaming with carrot, coriander and lettuce piled upon the slow cooked pork which was placed atop a halved steamed bun. The flavours were clearly delicious as they were devoured up quite quickly around the table to sounds of mmm and yum. We were all getting quite full from these delectable starters, but it was time for the main event: Pho served to us in under a minute. Craig explained the idea behind this was for people who were after a quick, healthy and tasty meal – in their lunch break or at dinner time – and one that would allow them to sit in store and eat it (due to the super quick cooking times) and actually feel like they have had a break. We had three flavours to choose from on this night – Tender Beef Scotch Fillet, Poached Chicken and Silken Tofu, however their menu caters for a bigger variety. 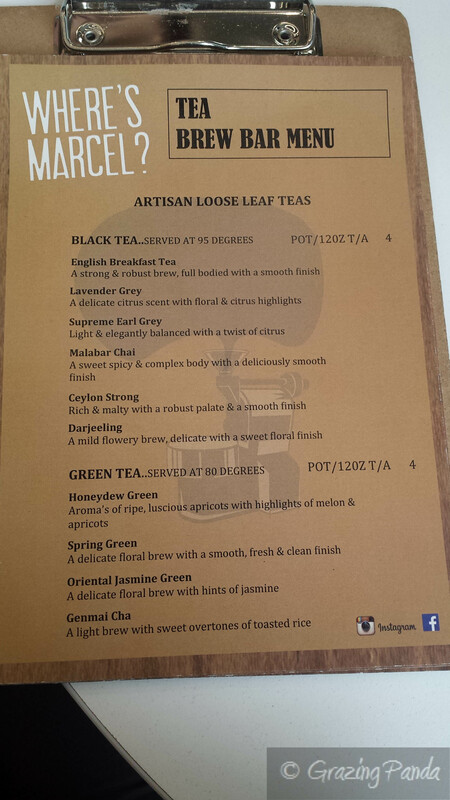 The Pho also comes in two sizes Regular (380ml) or Large (500ml). N ordered the Regular Tender Beef Scotch Fillet and I ordered the Regular Silken Tofu. The process was to simply order at the counter with a tray. Once you have placed your order just slide your tray along to the very end and by the time that you get down there – your Pho will be steaming hot and ready for you to eat! As you move your tray along you can watch as the team of staff preparing your order – each team member having their own responsibility; be it adding the noodles, broth or vegetables. Something interesting to note is that the noodles that go into your pho is weighed to ensure consistency between each bowl of Pho – this way each bowl has the same amount of noodles! The Pho broth is ready to pour out of a PhoStillery that has a beer tap to dispense the liquid out – quite nifty and quick! Unlike other Vietnamese restaurants who give you a plate of bean shoots and herbs separately – Pho24 already includes this in the pho making process. When you pick up your pho you can add lemon and chilli. And as mentioned before if you feel like you are in need of extra herbs (coriander and basil) you can cut this up for yourselves at the herb stations. N said the scotch fillet of beef was thinly sliced and cooked to perfect medium rare and was soft and tender – melt in your mouth. He said the broth was full of flavour and wholesome. I really enjoyed my silken tofu pho – the noodles were cooked perfectly – smooth and well textured. The tofu was perfectly sliced in thin rectangular pieces and was like soft pillows of goodness. I loved the crunch of the beanshoots along with the big kick of chilli (I added a whole load of chilli) – it paired well with the pho broth. Overall we both really enjoyed our pho meals and I struggled to finish my bowl due to the largeness in size. Craig was nice enough to offer everyone a tour of the kitchen and how each component was made – such as the sous vide meat packages, the large vats of chicken and beef stock that is left to brew for 6-8 hours, the pate that is freshly made onsite to the oven that toasts the buns for the Bahn Mi’s. Craig also mentioned to us that the name Pho24 not only came from wanting to be open 24 hours a day, but in fact there are 24 components that go into the process of making pho – from start to finish. Pho24 offers a healthy alternative for lunch or dinner at an affordable price point that works well for everyone, especially for students. The staff are friendly and you can tell that both Andrew and Craig really value the hard work and efforts of each and every one of them. Currently, Pho24 is open 7 days a week till late (usually around 9pm or 10pm) but is looking to being open 24 hours a day, 7 days a week. 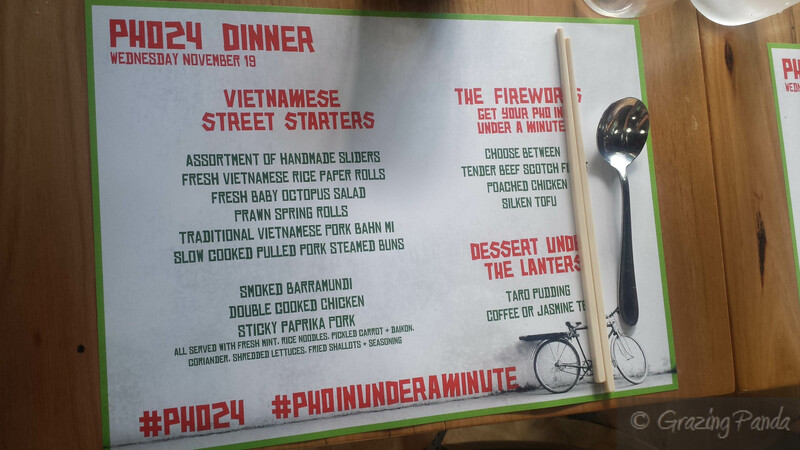 If you want to experience good tasting pho – IN UNDER A MINUTE – check out Pho24 now! Disclaimer: Grazing Panda was invited to dine at Pho24 as a guest by Two Birds Talking, however, opinions expressed here are purely my own and not influenced by them in any way.